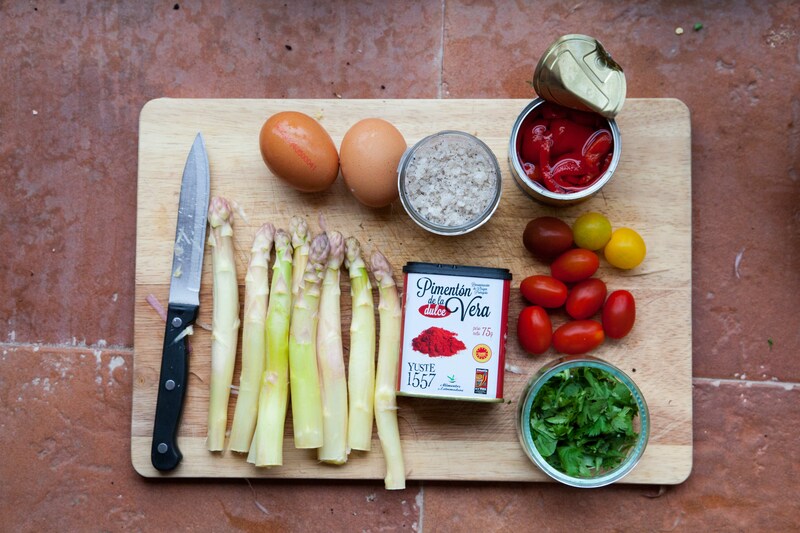 Part of the SouperchefannatravelsxSpain inspiration is the Revuelto with asparagus. Revueltos are a kind of scrambled eggs that usually contain cooked vegetables, like mushrooms, artichokes or squash. But during the warm-weather months, they are often made with wild asparagus. A revuelto makes an easy supper or lunch dish. It is sometimes served as an appetizer or a first course. We experienced a similar glammed up version made with truffles, white asparagus and 62 degree sous vide egg at a pintxos bar in Huesca. The white asparagus was obviously the real star, lightly cloaked in a creamy cloud of egg, with the truffle playing a supporting role. In Spanish homes, these scrambled eggs are widely eaten and often served for dinner since the preparation is simpler and quicker than the tortilla espanola. It is a perfect solution to use any leftover vegetables from the night before. We had this for a hearty breakfast in Zaragoza after having leftover white asparagus from our paella. The trick to make good revuelto, like all good scrambled eggs, is not to overcook the eggs. Eggs can go from perfect to overcooked in seconds. The eggs will continue cooking even after they have been removed from the stove. We made our vegetarian version with mushrooms, white asparagus, pimento dulce la vera (smoky sweet paprika) and truffle salt. 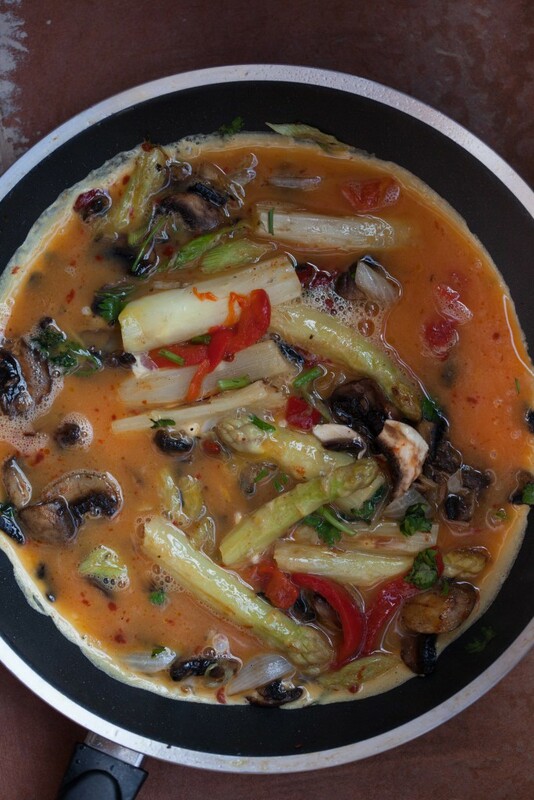 Lightly beat the eggs with the paprika in the bowl. Add salt and pepper to taste. Set aside. 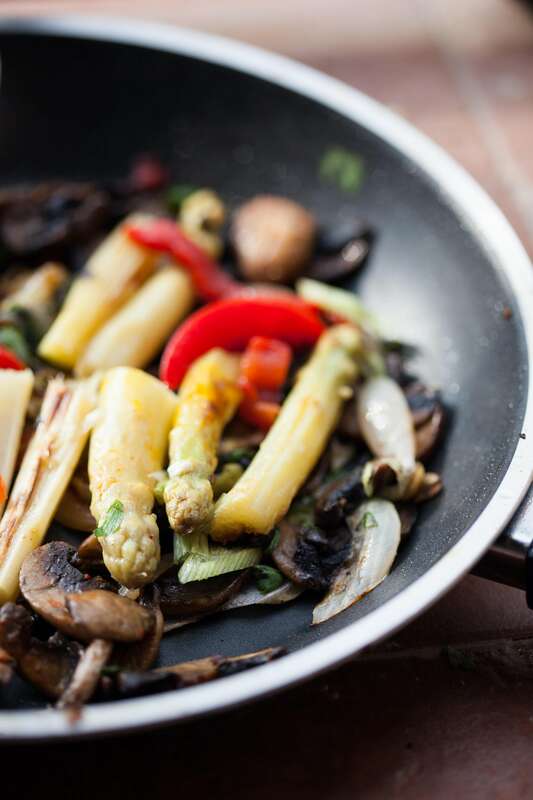 If using fresh mushrooms and asparagus, lightly saute the fresh mushrooms and the grilled peppers in a non stick frying pan till cooked through. 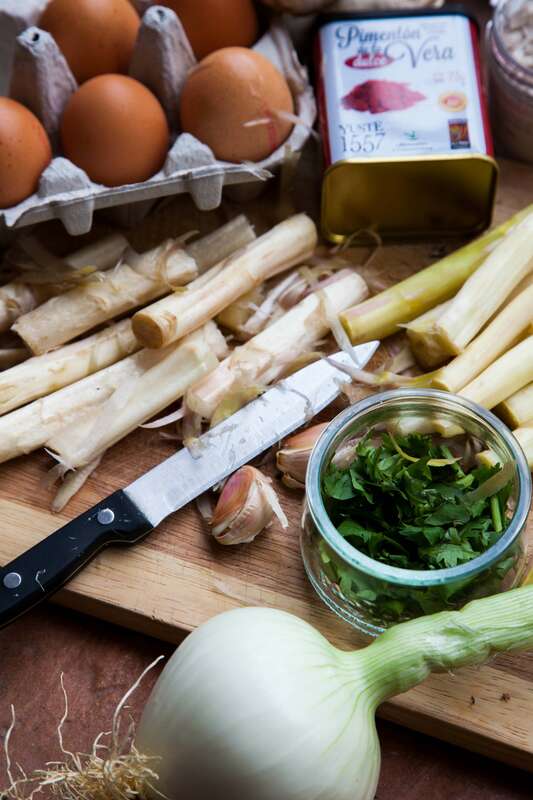 The white asparagus can be boiled for a very short time before adding to the frying pan together with the mushrooms. 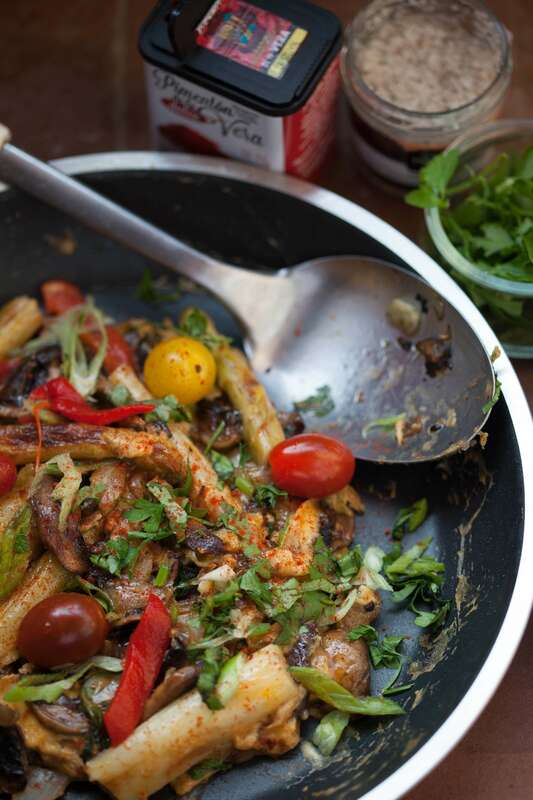 In the event, you are using leftover vegetables, just lightly heat it up in the frying pan. Turn down the heat and pour in the eggs. 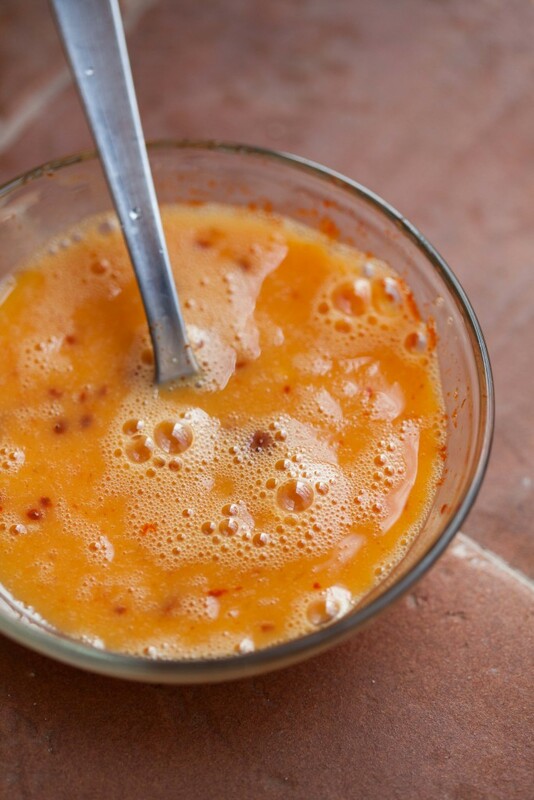 Using a wooden spoon, very quickly stir the eggs, turning and scraping until barely cooked and still a tiny bit liquid. It will take less than a minute. 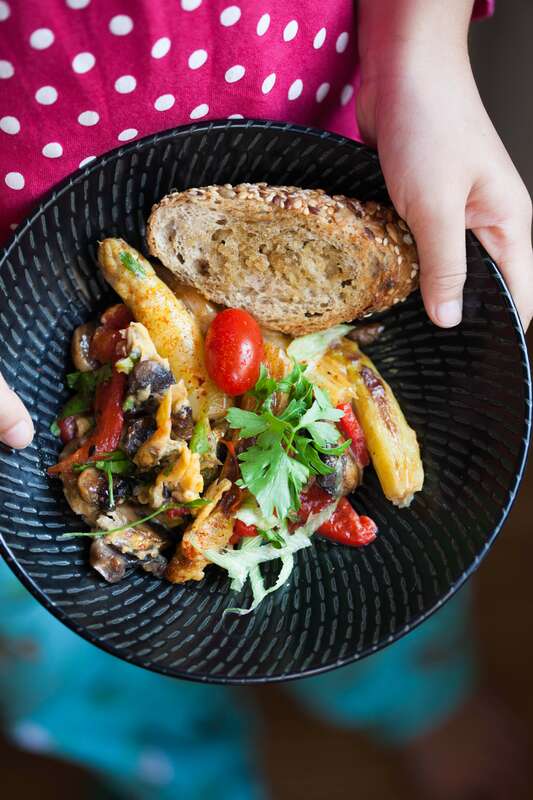 The eggs should be barely cooked with delicious moist curds barely jelling around the asparagus and sauteed button mushrooms. Pour on to plates and serve straight away with thick slices of toast. Sprinkle with smoky sweet paprika, truffle salt and freshly ground black pepper. Garnish with freshly chopped parsley and cherry tomatoes. Variations: chorizo or any kind of sausages or bacon can be added. A revuelto is a dish of scrambled eggs mixed with other ingredients. In Spain, you will find revueltos served in bars and restaurants, but they are also cooked at home. They are often served for dinner in Spanish homes, since the preparation is simpler and quicker than a potato omelette (tortilla de patata). Revueltos appear on menus with a wide variety of ingredients mixed into the eggs. Wild asparagus or esparragos trigueros are a popular Spanish vegetable and are eaten mixed with eggs. This is a vegetarian spanish style scrambled eggs, with added pimento asado and cherry tomatoes. Topped with a dusting of pimenton la vera dulce, truffle salt and freshly chopped parsley.